RollingStone takes you inside the dark underbelly of factory farming in the meat industry, where animals are turned into meat under the most horrific conditions. "Here’s the deal: Life for animals on modern day factory farms isn’t pretty. Forget those idyllic barnyard portrayals in children’s books. By and large, those places haven’t existed since your grandparents were in diapers. 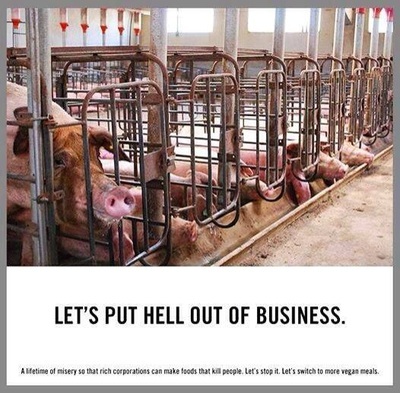 Each year on today’s factory farms, over eight billion animals are confined in windowless sheds, tiny barren crates, and filthy wire cages. 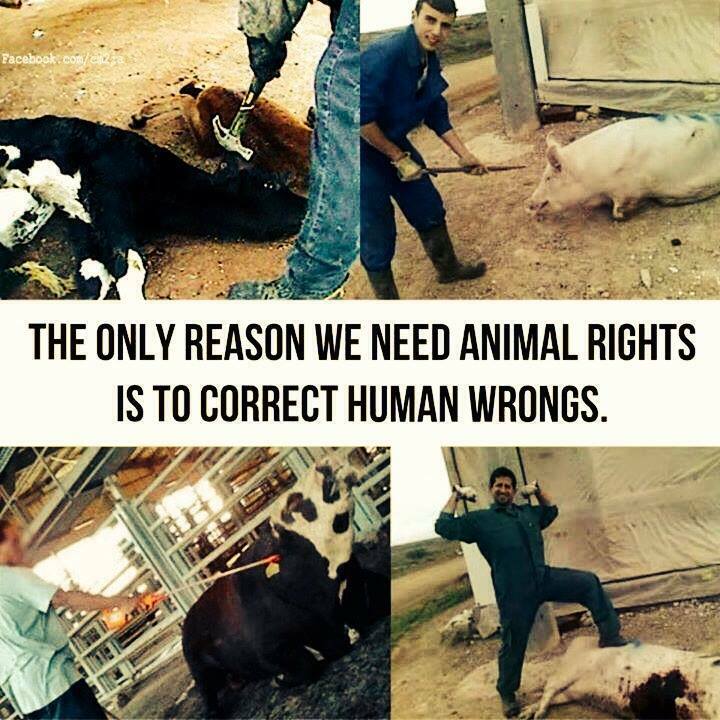 The vast majority of these animals are mutilated without painkillers, denied veterinary care, and ultimately slaughtered. Sadly, they have little to no legal protections. Simply put, life for them is a hell you wouldn't wish on your worst enemy. While the overwhelming majority of “food” animals live and die in misery and deprivation, a lucky few have escaped their cruel fates after being rescued by animal advocates. 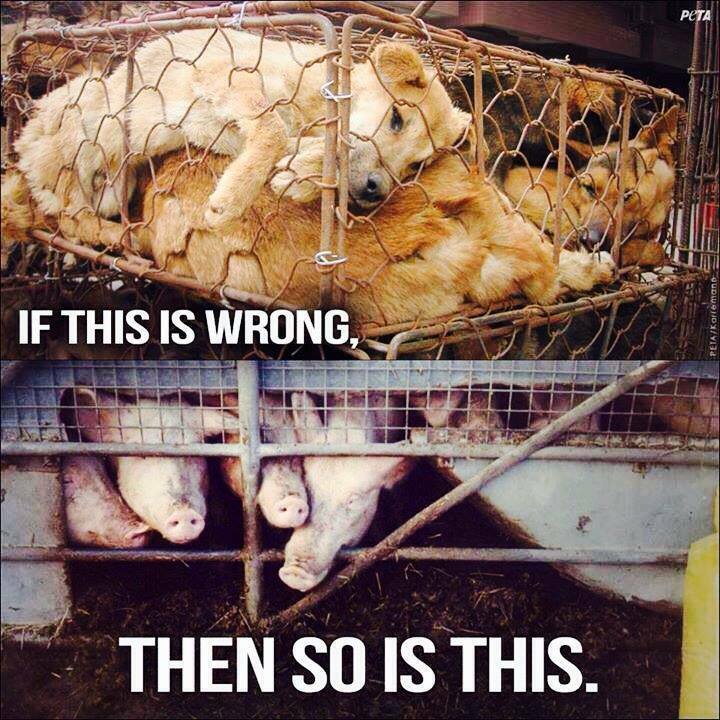 These are their stories:"
Animals are sentient and do know they are going to die. You can see how this one cow knows death awaits him. How heartbreaking. Saddest Slaughterhouse Footage Ever - Shows No Blood Or Slaughter - Understand what the last moments of life are like for animals in a slaughterhouse, so you know what you're contributing to and eating. Please Watch. "Society has conditioned us to believe that it’s okay to treat farmed animals differently than others because they don’t “feel” emotional or physical pain in the same way. However, this is a flat-out lie." 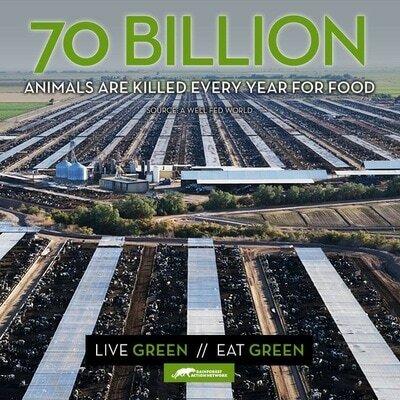 "It is no secret that most animals on factory farms suffer from poor health. Stuffed into filthy sheds with thousands of other animals and limited ventilation, disease spreads like wildfire in factory farms. For this reason, most factory farms administer “preventative” antibiotics in animal feed to keep them alive long enough to make it to market weight. 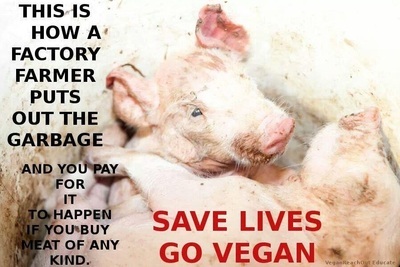 It is estimated that 80 percent of pigs have pneumonia when they reach slaughter, around 32 percent of beef cattle suffer from fatal liver abscesses, and millions of “broiler” chickens die from heart failure or infectious disease before they even reach slaughter. Many people are familiar with diseases like E. Coli, MRSA (Staph) and Salmonella that are spread through infected meat, but there are many other harmful diseases that stem from the factory farms that we should all be aware of." See also section on Celebrities Speak Out.